^ PressTV - Yemenis demand Saleh's ouster. Presstv.ir. [2011-02-13]. ^ Yemenis rally in support of protests in Egypt, 10 injured. News.xinhuanet.com. 2011-01-29 [2011-02-13]. ^ Gulf of Aden Security Review - February 10, 2011. Critical Threats. [2011-02-13]. ^ PressTV - Five injured in Yemen's street protests. Presstv.ir. 2011-01-26 [2011-02-13]. ^ Soldier wounded in clash with protesters in S Yemen - People's Daily Online. English.peopledaily.com.cn. 2011-01-22 [2011-02-13]. ^ Gulf of Aden Security Review - February 3, 2011. Critical Threats. [2011-02-13]. ^ 9.0 9.1 联合早报. 也门总统终于同意交权. 2011-11-24. ^ 2010 Corruption Perceptions Index. Transparency International. 2010. ^ Failed States Index Scores 2010. Fund for Peace. 2010. （原始内容存档于2010-07-03）. ^ Yemen Protests Demand President's Ouster. Associated Press (via CBC News). 27 January 2011. ^ Al-Qaida Gunmen Assassinate Top Security Officer in South Yemen. Xinhua News Agency. 18 January 2011 [11 February 2011]. ^ Yemen Protests: Thousands Call on President to Leave. BBC News. 27 January 2011. ^ Fielding-Smith, Abigail. Yemenis Call for an End to Saleh Regime. Financial Times. 27 January 2011. ^ 18.0 18.1 18.2 18.3 New protests erupt in Yemen - Middle East. Al Jazeera English. [1 February 2011]. ^ 海合会宣布中止调解. 凤凰網. 2011年5月24日 [2011年6月4日]. 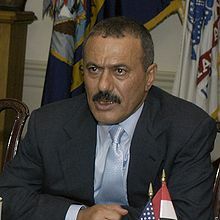 ^ Worth, Robert F. President of Yemen Offers to Leave, With Conditions. The New York Times. 23 April 2011 [24 April 2011]. ^ Yemen deal may be done within week: officials. Reuters. 26 April 2011 [27 April 2011]. ^ Yemeni Peace Process Collapses. The Australian. 2 May 2011 [2 May 2011]. ^ Yemen transition deal collapses. Al Jazeera English. 22 May 2011 [23 May 2011]. ^ Yemen's president vows to resist 'failed state' as tribes press offensive against regime. [2011-09-28]. （原始内容存档于2011-09-28）. ^ Street battles in Sana'a between Saleh loyalists and tribal guards. [2012-01-26]. （原始内容存档于2012-09-12）. ^ 也门总统府内一座清真寺遭炮击 造成总理受伤. [2011-06-04]. （原始内容存档于2011-06-07）. ^ 39.0 39.1 39.2 也门总统下令准备总统选举　朝野两党分歧明显. 新华网. 2011年9月4日. ^ 41.0 41.1 也门连日反政府示威50多人死 国际吁谈判解僵局. 中国新闻网. 2011年9月20日. ^ 也门总统萨利赫发表电视讲话 拒绝立即下台. 央视. 2011年9月26日. ^ 也门总统发表电视讲话 称将在几天内离职. 网易. 2011-10-08. ^ 48.0 48.1 网易. 也门总统称辞职后将权力移交军方. 2011-11-20. ^ 新华网. 也门反对派领袖巴桑杜出任总理 将组建新政府. 2011-11-28. ^ 也门第二大城市爆发流血冲突 已致5人死20人伤. 联合早报. 2011-12-01. （原始内容存档于2012-07-18）. ^ 也门成立全国军事委员会 实现国家安全和稳定. 新华网. 2011年12月5日. ^ 也门宣布成立新过渡政府 反对派获半数内阁职位. 中国新闻网. 2011年12月8日. ^ 58.0 58.1 58.2 58.3 58.4 "Yemen MPs Quit Ruling Party". Al Jazeera English. 5 March 2011. ^ 59.0 59.1 59.2 59.3 59.4 "Libya Military Action: Live Updates". The Guardian. 18 March 2011. ^ 60.0 60.1 60.2 "Yemeni Troops on Streets as Two Party Members Quit". Yahoo! News. 20 March 2011. ^ "Officials Resign from Ruling Party Following Violence Against Protesters" 页面存档备份，存于互联网档案馆. News Yemen. 19 March 2011. ^ 63.0 63.1 "Security Forces Blanket Yemen Capital To Enforce State of Emergency". The Guardian. 19 March 2011. ^ AFP: Yemen Rights Minister Resigns To Protest Crackdown. Agence France-Presse (via Google News). [23 March 2011]. ^ L'Orient-Le Jour. L'Orient Le Jour. [21 March 2011]. ^ 66.0 66.1 "Yemen Rights Minister Resigns To Protest Crackdown" 页面存档备份，存于互联网档案馆. Philippine Daily Inquirer. 19 March 2011. ^ 67.00 67.01 67.02 67.03 67.04 67.05 67.06 67.07 67.08 67.09 67.10 67.11 67.12 67.13 67.14 67.15 67.16 "Yemen Live Blog – March 21", Al Jazeera English. 21 March 2011. ^ 68.0 68.1 68.2 al-Kibsi, Mohammed (23 March 2011). "Yemen Officials Blame Aljazeera for False Reports" Archive.is的存檔，存档日期2013-02-09. Yemen Observer. ^ Yemen Ambassador to Syria Resigns from Post, Party. The Jerusalem Post. 21 March 2011 [21 March 2011]. ^ 73.0 73.1 73.2 73.3 "Top Army Commanders Defect in Yemen". Al Jazeera English. 21 March 2011. ^ 75.0 75.1 75.2 Authorities Release Journalists for Fear of Tunisia-Style Unrest. International Freedom of Expression Exchange. 26 January 2011 [1 February 2011]. （原始内容存档于2011-02-01）. ^ Yemen Deports Foreign Journalists. Al-Jazeera English. 15 March 2011 [15 March 2011]. ^ Attacks on Journalists in Yemen, Sudan Amid Street Protests. Committee to Protect Journalists. [1 February 2011]. ^ Staff. Bahrain Forces Fire at Protesters – Troops Open Live Fire Around Pearl Roundabout in Manama after Nightfall, at Least 66 Wounded. Al Jazeera English. 18 February 2011 [17 May 2011]. ^ Staff. Hague Condemns Violence in Libya, Bahrain and Yemen. BBC News. 19 February 2011 [17 May 2011]. ^ Staff. Leave Yemen, Ottawa Warns Canadians. CBC News. 6 March 2011 [17 May 2011].